Here’s a pretty short ballad by Misha Mengelberg. It’s on the album Senne Sing Song, which finds Misha accompanied by Greg Cohen and Ben Perowsky. The band uses every rest and fermata as a jumping-off point for flights of fancy and free improvisation, so it takes them six minutes to get through the form just a few times. This is another song I like playing with a second horn in place of a piano or guitar. 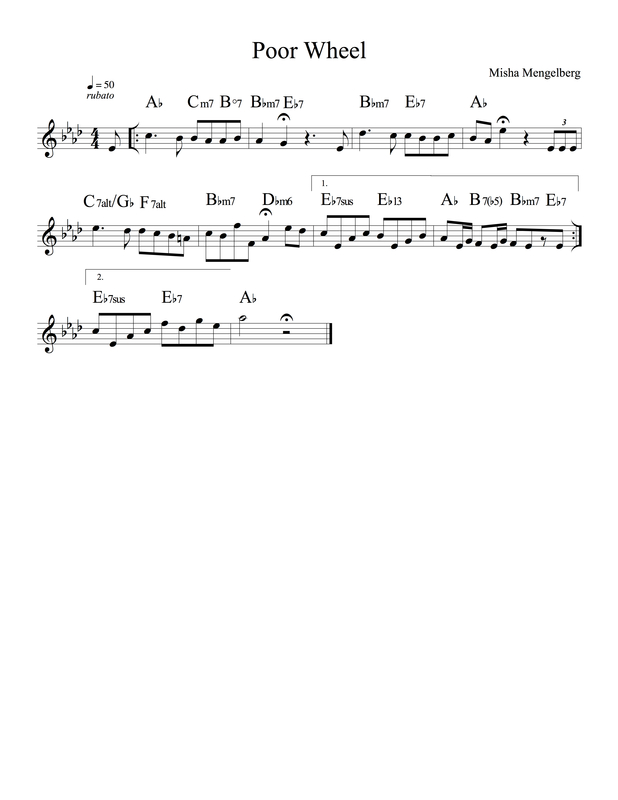 This entry was posted in Uncategorized and tagged jazz, lead sheet, Misha Mengelberg, music, Noteheads, Poor Wheel, transcription on April 1, 2014 by noteheads.